The order in which contacts names are displayed is a divisive debate that has been raging ever since there have been address books. Should the first name come first, or the last name? Microsoft Dynamics AX has made it’s stand by showing the first name first, but if you are a firm believer that the last name is king, then don’t worry, with a quick parameter change you can change the way that all of the contact names are displayed. The Print Management function within Dynamics AX is great, and got even better with the CU7 release of R2 when the ability to tokenize your e-mail destinations were added. But by default, there are only a handful of ways that you can segregate out your contact details, and if you have a customer that has multiple departments and you need to send out emails to different people depending on the purpose, it is still a little restrictive. Don’t worry though, you can create your own new Business Purpose codes within Dynamics AX and then use them within the Print Management to route different documents to different addresses. Rain or shine, that e-mail will now get to the right person. When you create a new Party record like a Customer, Vendor, Prospect etc. The default Record Type that is used is Organization, which is OK if you are always working with companies. But if you are working with people as your main account, then every time you create the record, you need to change the Record Type to Person. This soon becomes a little annoying. Rather than torture yourself, just change the default Record Type for those Parties to Person and life will be good again. Storing documents within SharePoint is cool. It allows you to browse through the documents, it allows you to have version control, it allows you to add metadata that you can use to search for documents, it does everything. The problem is that if you work in the AX client all the time, then you have to switch out of the application in order to view all the related documents. Don’t worry. 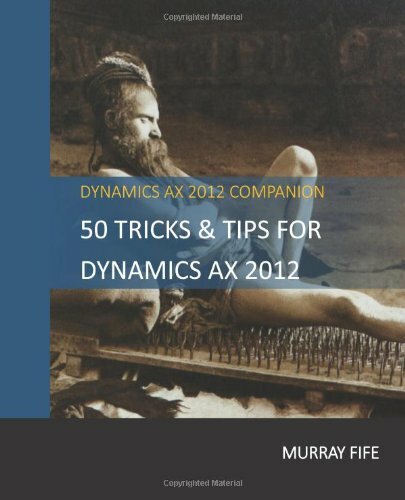 If you want to access all of the documents from within Dynamics AX then you can add it to the menu. Now all of the Axoraphobiacs out there don’t have to leave the application all day. You may think that the escalation rules can just be used to move a task up the corporate ladder when someone fails to pull their weight, but there is a kinder side of their nature as well. You can configure them to automatically approve tasks as well if they are not acted upon, making them a great way to have tasks assigned to users for review, but if they don’t have the time to act upon them, or if they just want to periodically review transactions, then the tasks that they do not look at will continue on their merry way through the workflow. It’s just like throwing a D20 to see if your workflow is reviewed.